How Would You Like a Spell a Day? 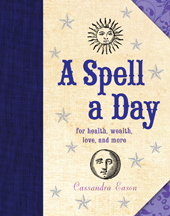 You may remember that on January 5, 2015 I reviewed “A Spell a Day: For Health, Wealth, Love, and More” by Cassandra Eason. I was quite the fan. What I didn’t mention was that I have an extra copy that I’d like to send to a good home where it will be loved. It’s also early enough in the year that you can catch up quick and be rocking a spell a day in no time! For the first time I’m trying Rafflecopter to see how it works. If it works out okay I’ll upgrade to give us all the fun bells and whistles for the next contest. Oh yes my friends, there will be other contests….